Well, the title's a mouthful, but I promise the actual salad is better. "Mom, what would happen if...." and this beautiful salad was born. Corn kernels, cornbread cubes and pecans roasted with a little maple syrup and Earth Balance until crunchy. All of this on a salad of baby greens and pomegranate seeds. And dressed with a Pomegranate Dressing. The corn gets crunchy with an incredible caramelized flavor and the 'bland' cornbread really perks up! If I sound like a restaurant advertisement, it's because I really AM trying to convince you how WONDERFUL these flavors are!! I am SOOO making this again next week for Thanksgiving!! Place corn, pecans and croutons in a bowl. Mix maple syrup with Earth Balance and drizzle over, tossing lightly (I used my hands) and coating everything evenly. The croutons should not be soaked, just evenly coated. You may not need all the maple syrup mixture. Pour corn mixture into a shallow baking dish or cookie sheet and spread in a single layer. Place in 400 degree oven for 5 minutes, stir, then check every two or three minutes until things start to brown but not burn! Not everything will brown evenly or at the same rate, that's OK! Remove from oven and spread on a plate to cool. Put baby greens in a bowl or platter. 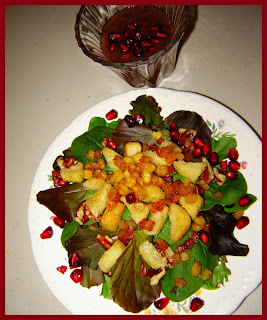 Sprinkle with pomegranate seeds and top with maple roasted corn, pecans and croutons. Wisk all ingredients, except pomagranate seeds, together. Add seeds and pour over salad. That's a creative way to use left over bread if I ever heard one. Sometimes the best recipes come from being 'arsty-fartsy' with left overs.